When I was looking at getting a better broadband connection to my home in a small village in the middle of Essex I came across FibreWifi http://www.fibrewifi.com. This is a broadband service that does not need cable to get to your house. It is a radio broadband service from Buzcom Wireless Innovation. At the time of writing, their website is short on detail about what to expect from the installation. Hopefully this summary will help future potential customers. The radio is small and discrete. A tall and thin white plastic box about a foot (30cm) long and only a few inches (5-10cm) wide. This has to be outside facing towards one of the transmitters or repeaters. Depending on the result of a survey, it might simply attach on a bracket to the side of your house. In my case it had to be mounted on an 8 foot (2m) long pole right up at the apex. The radio is on the top end of the pole and mounts vertically. They have to be able to get a minimum signal level and a high enough signal to noise ratio before they will even attempt to provide the equipment. It depends on which transmitters or repeaters they can get a signal from at your house. How visible is the equipment? Much to my surprise they used a fairly narrow chromed pole with some simple brackets. 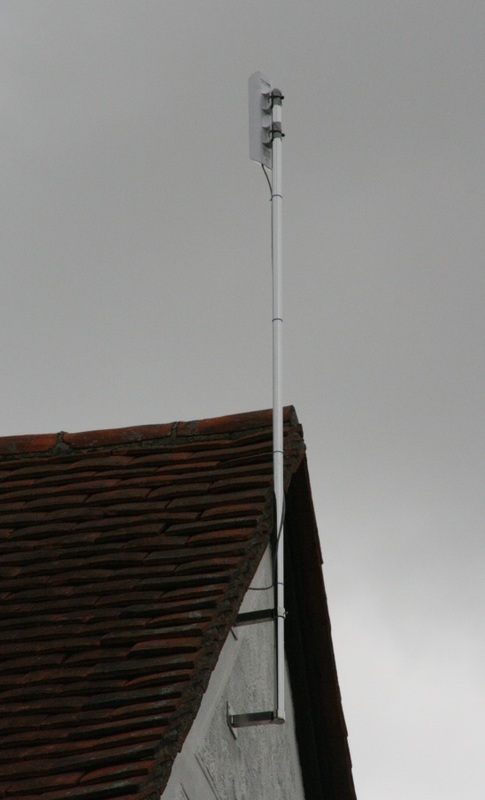 Once up, the white plastic radio blends in to the sky and all you notice at a glance is the small (1inch, 25mm) diameter pole. The web site only lets you order the installation initially. I then received a phone call to book which Wednesday they would come and visit to carry out a survey. Yes, the installation team only works Wednesday's. In my case the survey resulted in the team having to hold a long pole while standing on a long ladder and finally got a signal. As it turns out the repeater they hooked on to is in Wickham Bishops which they could tell me was just over 3 miles away in a straight line. The signal, I am told, does not like passing through trees and from my experience will not pass through the roof of our house! The people they surveyed before me were less than half a mile away the other side of the village but could not get a signal at all! I think this is the major downside to the service that it will still disappoint lots of people because you need line of sight to a transmitter or repeater for it to work. They have to get the brackets made to order for the mast therefore I needed a second Wednesday visit. As it turned out a third was needed before they managed to mount the mast and radio in a suitable spot. Although a bit frustrating having to wait all those weeks, the team from Computer Giant who did the installation did put themselves out to try every possibility. There is no way I would have gone up to the height they were working to get the job done. What is the cabling like? The radio has a single Cat 5 network cable nailed to the wall. Run down or round the house and passing through the wall in to a suitable room. What size is Cat 5 cabling? Anyone in I.T. would recognise this as the standard computer cabling used in nearly all offices. It usually has a grey outer sleeve about 5mm diameter with 8 fine insulated copper cores inside which is terminated with an RJ45 plug. Usually clear plastic square plug about 10mm wide. If you know what the typical telephone cable looks like that comes in to domestic houses it is about the same sizes as that. You need at least one spare power sockets inside the house. This is for the Power Over Ethernet (PoE) inserter which is connected to the end of the cable coming from the radio and then another network cable runs from there in to your computer or a cable router. The cable router is NOT included in the installation cost. It is also not needed but is recommended by the installers. The PoE inserter is about the size of a computer mouse but square. The cable router is likely to be the same as any home router. About the size and shape of a small book. With hindsight I would not have bothered with the cable router. My own router is all I use now. I only purchased their router so I could copy the config. I was told by the installers that the alternative was to pay them to configure my router. This is NOT necessay. If you are competent at configuring IT all you need to do is set your cable router to accept a dynaically allocated IP address. There are no other settings needed, no username and no password. The MTU setting on the router was 1500 which is usually the default anyway. That's the information that I would have liked to have known in advance and is currently (July 2011) missing from their web site. I have a working connection using that wireless link and it is better than my ADSL line. I have found it difficult to get reliable speed test results. It depends on the time of day. However none of the speeds are bad just not always as high as expected. I have results between 4 and 11 Meg bits per sec download and between 2 and 6 meg bits per sec upload. The UK ping times varying between 15ms to 25ms depending mainly I think on the site at the other end. I am happy with those as results but they are not the 12Meg down and 12Meg up (12mega bits per second) quoted on the web site. Firstly I should say that there are no serious problems just a feeling that one hand does not know what the other is doing. I got the impression that the people at FibreWifi did not know the installation company sell their customers routers and charge configuration fees. I also had to phone to find out about paying for the subscription. They informed me that I have to wait for the installation company to notify FibreWifi and then I would receive an e-mail to give me instructions. In the mean time I was able to use the service at full speed. In this day and age I had expected all that to have have been on the web site. I wanted to ensure my connection was working as fast as it could because the erratic speed test results were not always helpful. Someone from their technical support called me back the following day after having run some tests all night. They have tested 12Mbits per sec download and 6Mbits upload. Based on my location they think this is the best I will get. I also sent an e-mail on Sunday to ask if any ports were restricted because I was having trouble getting a connection to a server working. I received a mail from the Managing Director within an hour, on a Sunday, with confirmation that nothing is blocked which was enough information to be going on with and a promise that my problem would be passed on to technical support to look at. A better connection than I could have hoped for living where I do and despite some bad weather its been working reliably for several days now. Update October 2016: For perhaps the last year FibreWifi has had very poor performance during peak times. I have been told that they have put in a larger backhaul radio link at one congested point but that has barely improved the service for me. This is disappointing because I know the link to my house will work at 12Mbps but barely has 3Mbps in the evenings when I am most likely to use it.